Today, Activision announced that a slew of new Skylanders Turbochargers products will debut at San Diego Comic Con. The convention, which begins on Thursday, July 9th, always plays host to reveals of hot new products, and in particular those for serious collectors. With that in mind, the biggest announcement is that Skylanders Superchargers will be the third game in the series to be available in a limited Dark Edition. The Dark Edition features the same game, of course; the difference is in the figures and vehicles. Available for all console versions of the game, it will include all of the same toys, but in exclusive black and silver coloring that will transfer into the game. That means that the Xbox and PlayStation editions will have Dark versions of Spitfire, his vehicle Hot Streak, and Super Shot Stealth Elf. The Wii U version replaces Stealth Elf and his vehicle with Dark Turbo Charge Donkey Kong and his Dark Barrel Blaster, while the Wii Version will include Dark Hammer Slam Bowser and his Dark Clown Cruiser. 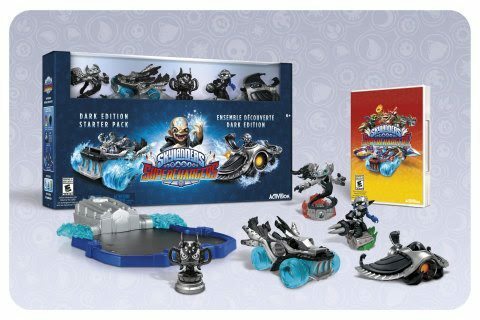 There will also be two extra toys in the Dark Editions: they will include a Dark version of the vehicle for the included Skylander whose vehicle isn’t included with the normal Starter Pack, along with a “Kaos Trophy” which unlocks gameplay elements that have not yet been explained. There will also be six new Eon’s Elite figures shown at San Diego Comic Con. These are versions of Skylanders from the first game in the series with three times the power, unique designs, and display cases. Like the previous releases in this line, the new figures will feature a metallic paint job and a case with a lenticular 3D background. Additionally, these new figures will come in brand new sculpts, showing off their fully upgraded appearances. 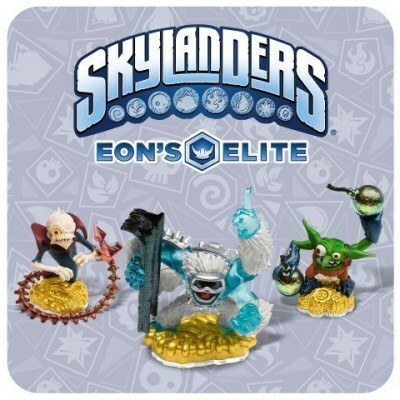 The first wave of these new Eon’s Elite Skylanders will include Slam Bam, Zook, and Voodood, and will be available exclusively at Toys R Us in November. The second wave will include Ghost Roaster, Boomer, and Dino-Rang, and will be available starting in December. Various other products will be available for sale at SDCC as well. These include comics, books, and costumes. For those attending the convention, these will be available at the booths of their publishers. There will also be a dedicated Skylanders section, where fans can take pictures with props and costumed characters, and even have a chance to win an exclusive version of the Hot Streak vehicle. Other Skylanders giveaways will be available at Nintendo’s and Microsoft’s lounges at the convention.